The corner bus stop in my neighborhood is kind of like the Poem written about Kindergarten, you learn everything you need to know there. Given the broad diversity in my community, this week an exciting buzz focused on recipes and menus for the upcoming Jewish Holidays, Rosh Hashanah and Yom Kippur. 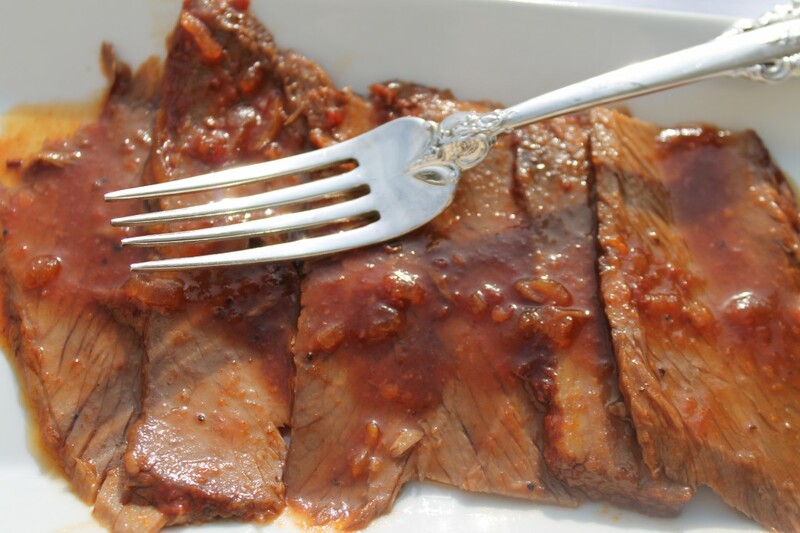 The most popular among the main courses served at these family gatherings for Rosh Hashanah is the Beef Brisket. The Beef Brisket thoroughly discussed daily, ranging topics from ingredients and spices used on the brisket to the marinade sauce, preferences of oven or range cooking, braising, roasting, preparation cooking times and techniques and who in the family prefers wet brisket to dry brisket. More than anything else, that I learned at the bus stop discussions this week revolved tradition. The tradition of individuals who will make the Beef Brisket for their families using the recipes and techniques of their mothers to great grandmothers, and lots of “bubbies” (grandmothers) in between, or in Heather’s family, she was called: ‘Baubie’. 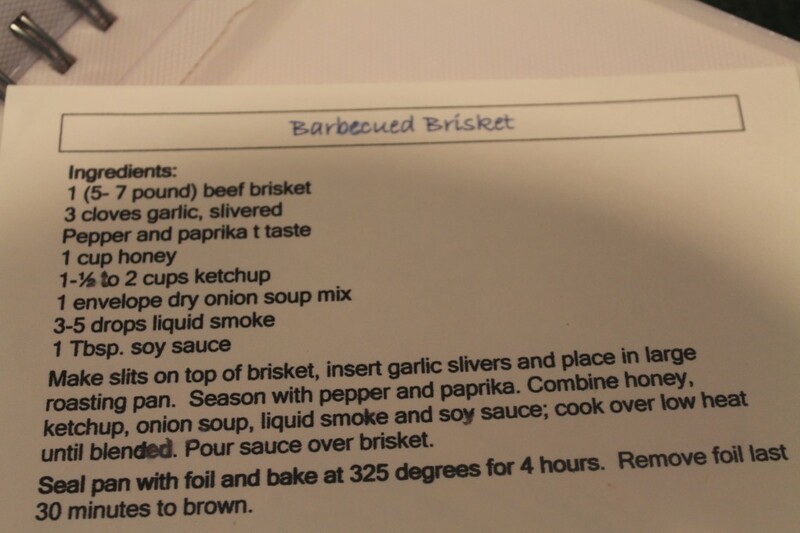 With a busy week in holiday preparations, time spent seeing children off and back at the bus stop each day, Heather, a pre-school teacher at an area synagogue provided the generous invitation to her home to prepare Baubie’s Beef Brisket Recipe which is shared below. 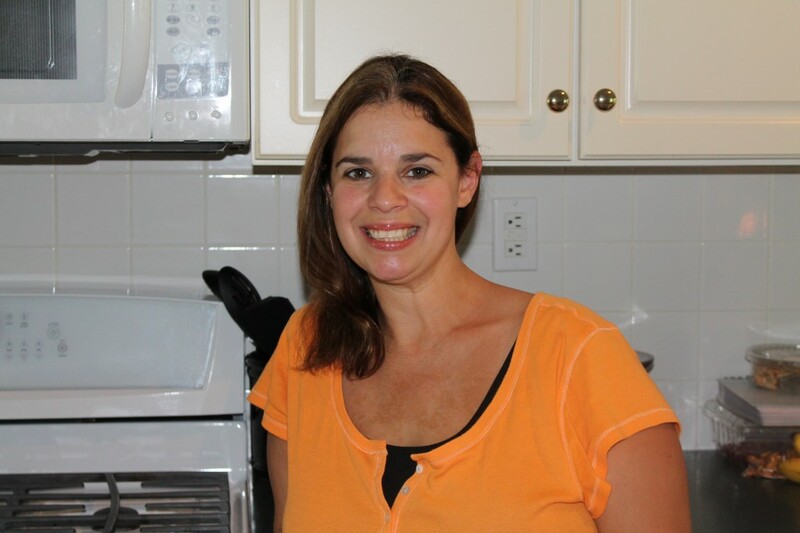 Heather now doubles the recipe making two briskets, enough for leftovers, and a little added feeling of plentiful as the guests numbered at the Jewish holiday celebrations of her childhood. Rosh Hashanah at synagogue sounds the shofar, a horn traditionally from a ram, blown as a trumpet, signaling the beginning of the Jewish New Year. It also marks the time beginning reflection and repentance before the solemn Yom Kippur, thinking through the past year and determining resolutions or ways to live better such as growth improvements or kindnesses in one’s personal life. 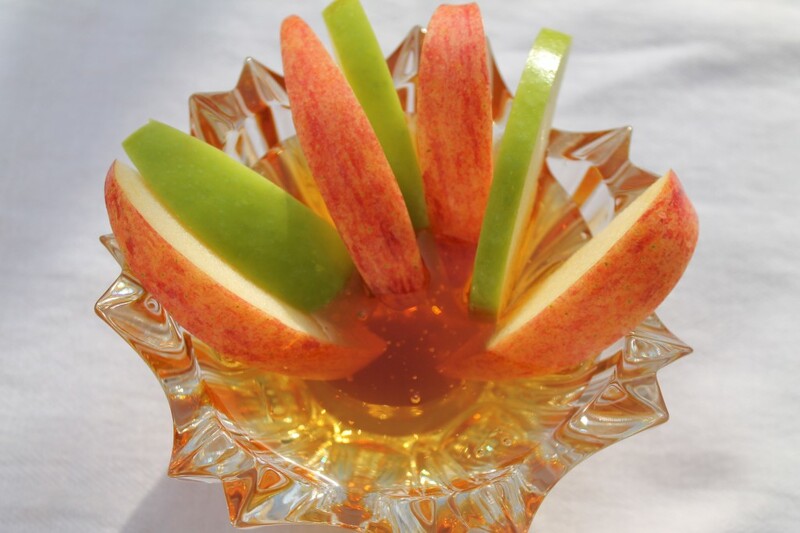 Some symbolic foods eaten at Rosh Hashanah include eating apples dipped in honey encouraging the hope of a sweet New Year ahead. Challah bread is popular to serve at Rosh Hashanah celebrations, shaped round into a spiral instead of the usual elongated shape. The spiral shape of the challah represents continuity of creation and the cycle of the year. Serving sweets is traditional for Rosh Hashanah and Pat, a respectable baker, and a regular bus stop attendee for her granddaughter whenever visiting from Florida for the Jewish Holidays, will provide her recipe for Jewish Apple Cake called: Grammy Rose’s Apple Cake. Pat’s recipe will be Posted next Monday on Rosh Hashanah, on Spiced Peach Blog. Friends and families, blog readers, and all those at the neighborhood bus stop, Happy Rosh Hashanah. L’shanah tovah! 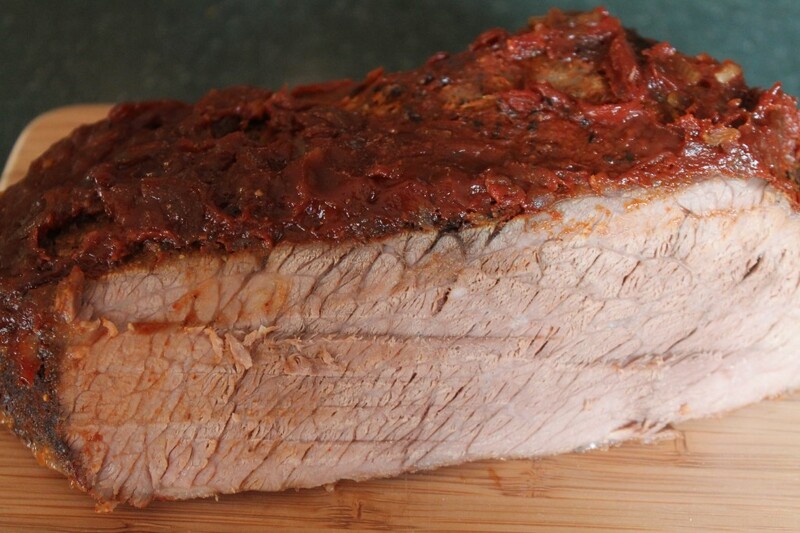 Cut slits into both the top and bottom of the brisket and insert garlic slivers and place into a large roasting pan. Season with pepper and paprika. 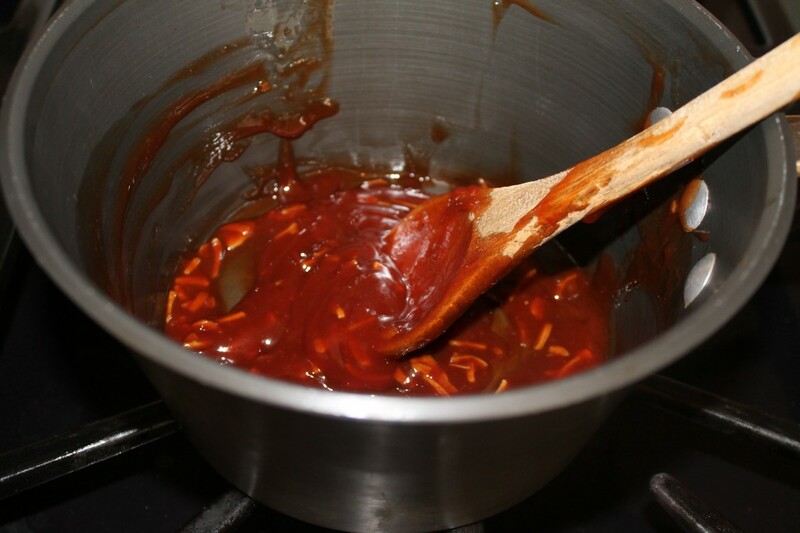 Combine honey, ketchup, dry onion soup mix, liquid smoke and soy sauce; cook over low heat until well blended. Pour sauce over brisket. Seal pan with foil and bake in 325 degree oven for 4 hours. Remove foil and continue to cook for another 30 minutes to brown. Refrigerate for at least one day before slicing very thinly across the grain. Heat and serve with the sauce. Note: Instead of sprinkling on pepper and paprika to taste, Heather shakes paprika onto both sides and spreads it across the meat almost like a rub. Reduce heat to 275 degrees for the last half hour of cooking. This entry was posted in Beef, Foods Around the World, Holiday Favorites, Meats and tagged Baubie's Beef Brisket, Beef Brisket, Beef Brisket for Rosh Hashanah. Bookmark the permalink. Post a comment or leave a trackback: Trackback URL. Thanks for your comment Karen. 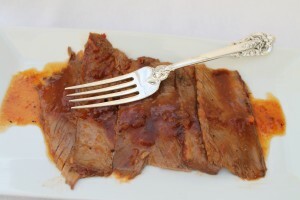 I have had your beef brisket and it does have similarities to the recipe ingredients used in your families recipe. 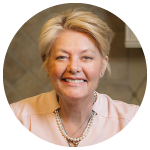 It is a good example on how recipes spread between people and communities according to what was available or popular at the time, and then the added variations of seasonings here and there. Thanks for being a part of the conversation.